New to the market in Pavones is this new 3 bedroom, 2 bathroom home on a titled lot walking distance to the beach. Listen to the sound of the waves from your bedroom! This beautiful brand new home near the beach features high ceilings, lots of windows, a large covered outdoor living area, and a modern style. Its solid construction techniques, secure bodega, and integrated security system make it a secure choice as well. And priced at only $189,500, this is a deal that can’t be beat! Pavones is located in the southwestern portion of Costa Rica, about three hours south of Dominical. It’s a magical place, with pristine, deserted black sand beaches, an abundance of scarlet macaws, and waves out of every surfer’s dreams. Pavones is on the Golfo Dulce, the “sweet gulf”, where marine life abounds and it is not uncommon to see devil rays, dolphins and even whales. In the small town of Pavones, you will find a few restaurants, a couple grocery stores, a soccer field, and a world-class left point break. This brand new home is about eightminutes by car from the town of Pavones, halfway between Pavones and the fishing village Pilon. The house is on titled land only 400 meters from a beautiful, empty beach. This brand new home near the beach has a clean, efficient design. It is full of windows for lots of breeze and light. The high ceilings and wood-style tile floors give the home a modern feel. The heart of the house is a combined kitchen and living room, which connects through a sliding glassdoor to the covered outdoor living space. The first bedroom and bathroom are located off of the kitchen. There is also a loft in this area, accessed from the living room, that would make a great third bedroom or home office. The last bedroom and bathroom are accessed by another sliding glass door from the outdoor living area, providing them with a bit of extra privacy. There is also a secure bodega with a steel door, an excellent feature for added security when you are out of town. Situated on a lot of 1/8 acre, there is enough room for a garden of vegetables or flowers, or both, depending on your choice. Maybe you’d like to have a bigger garden? Or move to Costa Rica full time and enjoy fresh mangos and avocados from your backyard? 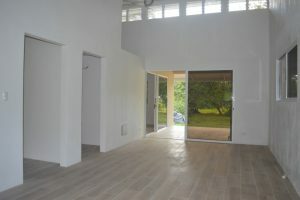 If you&#39;re interested in more land, or if you’d like to get residency in Costa Rica, the sellers of this home are offering a package that might interest you. The base price of $189,500 will get you this brand new home by the beach and 1/8 acre. For an additional $30,000, you can own the titled lot adjacent to the home, and you will also receive the seller’s assistance in obtaining residency in Costa Rica as an investor (which requires at least $200,000 investment in the country). What’s better than finding your dream home and becoming a resident of Costa Rica at the same time? 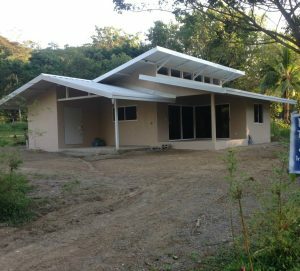 For only $219,500, you can own a brand new home on 1/4 acre and have your Costa Rican residency. 0.125 ACRES – 3 Bedroom Brand New Home Conveniently Located Close To Several World Class Point Breaks!! !